This morning, the Dodgers tweeted to their legion of followers that they would soon announce who would be bobblehead #8 this coming season. So, who do you think that is? Clearly, he's a right-handed pitcher. He's got a big wind-up. Are you done guessing, yet? 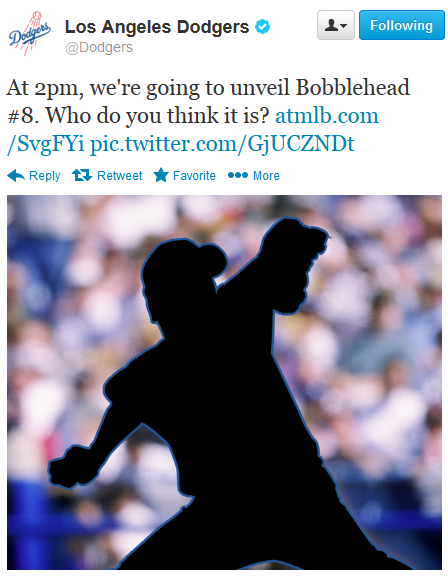 Well, the mystery bobble will be Hideo Nomo! WooHoo! 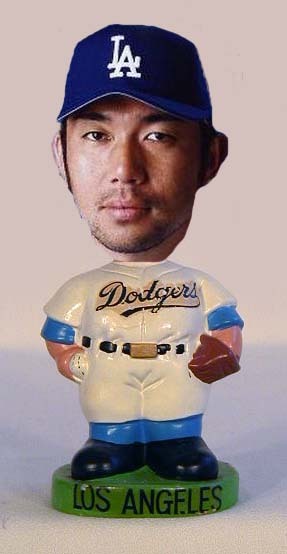 Below is my own artistic conception of Nomo's bobble. Now, who will be bobblehead #4. BTW, there is an 11th bobblehead, but it's of Hello Kitty. So, it really doesn't count. It will be handed out on 9/9. Collection: Jay Johnstone "The Moon Man" - Who Is that Guy? Check out the card above. 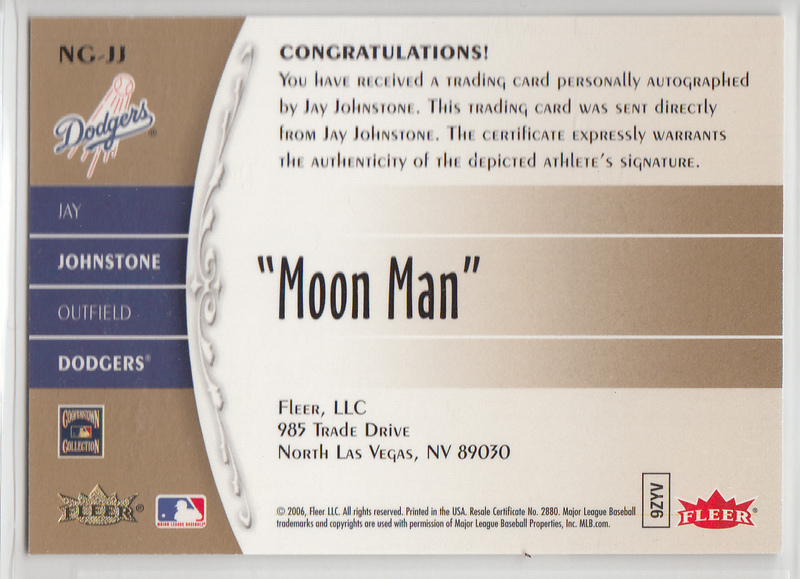 It is a 2006 Fleer Greats of the Game "Nickname Greats" autographed card of Jay Johnstone. Notice, though, that it is clearly not Jay Johnstone in that photo. Johnstone had crazy curly hair. Besides, the man in the photo above looks way too serious, and that's not a word I don't think anyone would ever use to describe this renowned prankster. He pulled off a number of infamous pranks during his playing days, including placing a soggy brownie inside Steve Garvey's first base mitt, setting teammate's cleats on fire (known as "hot-footing"), cutting out the crotch area of Rick Sutcliffe's underwear, locking Dodger manager Tommy Lasorda in his office during spring training, once dressing up as a groundskeeper and sweeping the Dodger Stadium infield in between innings and then hitting homers the next, nailing teammate's cleats to the floor, and replacing the celebrity photos in manager Lasorda's office with pictures of himself, Jerry Reuss and Don Stanhouse. One time, during pre-game warm ups, he climbed atop the Dodger dugout and, in full game uniform, walked through the field boxes at Dodger Stadium to the concession stand and got a hot dog. He also once dressed up in Lasorda's uniform (with padding underneath) and ran out to the mound to talk to the pitcher while carrying Lasorda's book and a can of Slim Fast. Anyway, does anyone have a guess as to who is in the photo above? BTW, I first got wind that this was a wrong photo through Dodger Bobble in a post earlier this year. Some of the commentators on that post think it may be Jim Lefebvre. What do you think? 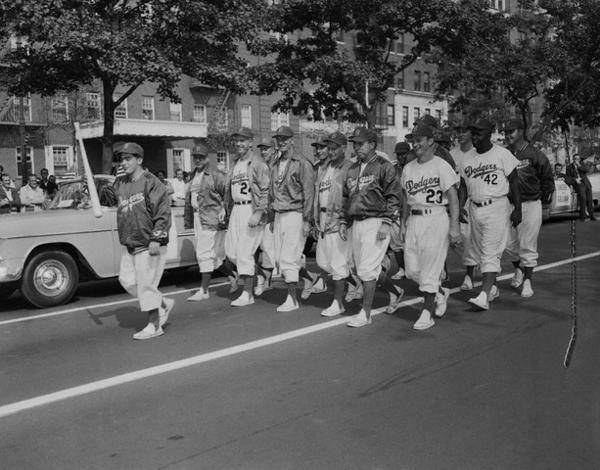 The Dodgers shared a great vintage pic on twitter of the Dodgers marching in (I believe) the 1955 World Series victory parade with Dodgers batboy, Charlie "The Brow" DiGiovanna," leading the pack. 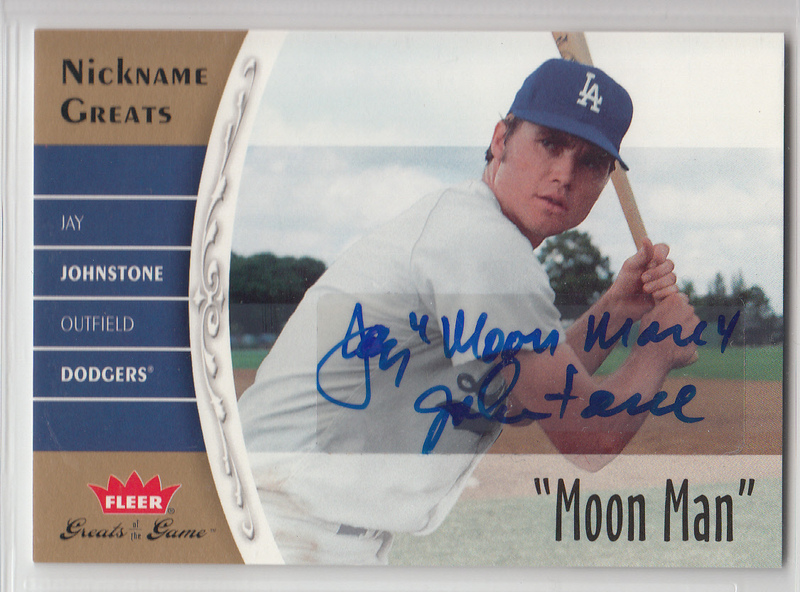 BTW, Charlie is well known to collectors as the brilliant ghost signer for many Dodger players. The Dodgers lost a member of the family recently. Longtime Dodgers equipment manager “Super Dave” David Wright recently passed away, via Dodgers photographer Jon SooHoo. Jon shared a photo of him, here. RIP. BTW, here is something I didn't realize, the Dodgers have had only 3 equipment managers since they've been in LA. There's a lot of posturing going on in the Hyun-Jin Ryu negotiations. Yesterday, there was quite a bit of back-and-forth regarding the Dodgers lack of an offer as indicated by Boras and Colletti mentioning the slow pace of discussions. Now, Boras states that Ryu could pitch in Japan, and that he wants a contract that pays him like a No. 3 MLB starter right out of the gate. I do not know if it's a good sign that negotiations have become this public. Maury Brown at Baseball Prospectus speaks with Stan Kasten. So, I said to Mark Walter, the head Guggenheim, if we’re going to do the Dodgers there’s someone I want you to meet that will fit perfect into join our group and that was Magic. I had known him for many, many years from my time in the NBA, so we met, hit it off and decided to have us all come together. And, in doing so, the three elements that our group brought to the table was Guggenheim and all the resources they could provide. There was me with my experience in building baseball franchises, and then there’s Magic, who singlehandedly embodies winning and a dedication to fans in Los Angeles like no other human being on earth. So, we thought if we put those three things together we’d be a very strong combination. Bill Shaikin of the LA Times noted on twitter that Yasiel Puig is likely to start 2013 in AA. 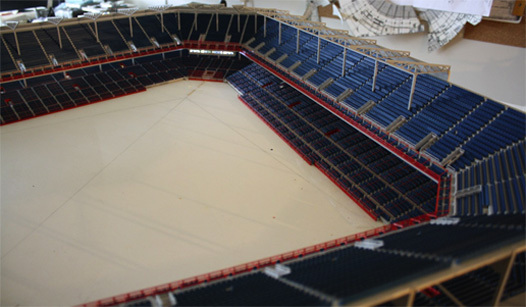 Ballpark modeler Steve Wolf is working on a Ebbets Field replica model and expects it to be completed in time to be featured during REA's 2013 auction, via Sports Collectors News. Ashley Burns at With Leather features the greatest piece of street art I have ever seen. Bar none! 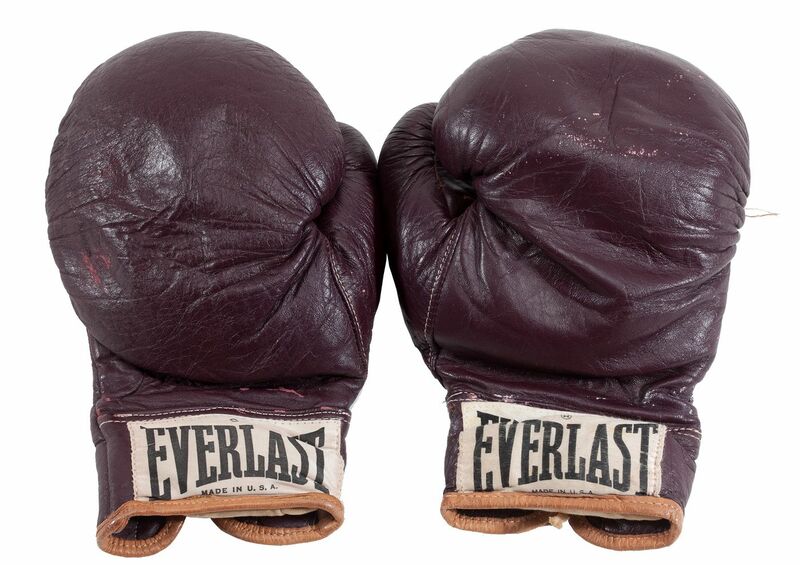 FYI, the pair of gloves worn by Muhammad Ali in his 1971 bout against Joe Frazier recently sold at SCP Auctions at the record price of $385,848.00. This boxing match was called "The Fight of the Century." As Sports Collectors Daily notes, this (along with the gloves Ali wore against Sonny Liston in 1964) sold at world record values. See the Ali vs. Frazier gloves at right.